The Washington area's struggling subway system won't get a federal bailout, House Republicans said Thursday as they blamed the Metro system's recent series of crises on poor management rather than a lack of funding. The deteriorating state of the nation's second-busiest transit system was the subject of a hearing held Wednesday afternoon by two House oversight subcommittees. Last month, Metro's general manager made the unprecedented decision to shut down the system for an entire day for emergency inspections of third-rail power cables. The shutdown followed two fires that were sparked by faulty power cables, including one in January 2015 that killed one passenger and sickened more than 80 others. Metro's board chairman said the problems can be traced to decades of deferred maintenance that stems, in part, from Metro's lack of a dedicated funding source. The system's operations are funded by the District of Columbia, Maryland and Virginia, while Congress provides $150 million a year for capital improvements. Metro receives other federal grants, although those come with strings attached. Rep. John Mica, a Florida Republican and the chairman of one of the subcommittees, said Metro doesn't know how to spend the money it has. He said the system is currently sitting on $783 million in unspent federal grants. Mica and Rep. Mark Meadows, a North Carolina Republican and the other subcommittee chairman, had an angry exchange with Metro board chairman Jack Evans after Evans said the federal government should contribute $300 million a year to the system's operating budget. Meadows said that would give Metro the highest operating costs of any transit system in the nation. Evans, a Democrat who is also a D.C. Council member, said Metro needed more money to become a world-class system like those in London, Paris or Beijing. He also said the federal government should take more responsibility for fixing it because half the federal workforce commutes on Metro. Evans called the Metro crisis "the most critical issue facing our region." 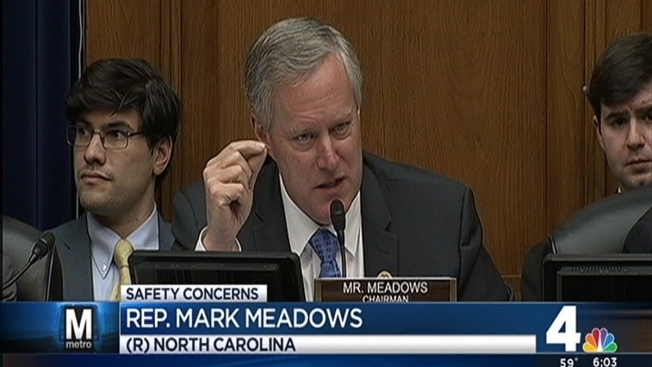 After the hearing, Meadows said he would not rule out trying to secure more federal funding for Metro if management first showed it was up to the task of making the system safe and reliable. ``If they're serious about fixing the problem, I want to make sure they have the right resources, without a doubt,'' he said. Rep. Gerry Connolly, a Virginia Democrat, said it was a ``myth'' that Metro was sitting on more than $700 million, pointing out that the money was designated for specific expenses, such as the purchase of new rail cars. The system is phasing out 40-year-old rail cars that exacerbated a collision in 2009 that killed nine people, but the cars are manufactured in Japan and their delivery has been delayed. ``It is actually good and prudent management not to pay your bills until the product or service has been delivered,'' Connolly said. Metro's general manager, Paul Wiedefeld, who took over in November, said in written testimony that he's found ``systemic issues with regard to track, power and car maintenance,'' and he said he would submit a new maintenance plan to the public in 4 to 6 weeks. Before the hearing, in a meeting with senators from Maryland and Virginia, Wiedefeld suggested that, given the system's maintenance needs, it may not make sense anymore to keep it open until 3 a.m. on Saturday and Sunday mornings. The system closes at midnight the rest of the week. Wiedefeld said Metro's crisis to crisis mode of dealing with problems is completely inefficient and wasteful, News4's Adam Tuss reports. Wiedefeld also spoke of a disconnect between front line Metro workers and management. Wiedefeld - "there are things we may have to shut down between stations. We also have to look at our weekend and late night service." Evans also said additional closures would be necessary to deal with the maintenance backlog. Evans previously suggested that the system might need to shut down entire rail lines for up to 6 months at a time, a plan that Wiedefeld later said he was not considering. Meadows criticized Metro for its public disagreements over the possible shutdowns, as did Sen. Tim Kaine, a Virginia Democrat, at the earlier meeting.